The CVT-7A is a microprocessor based voltage regulator testing unit. Thank you for your interest in the CVT-7A. Please fill out the form below so we can send you the brochure. Thank you for your interest in the CVT-7A. Your request has been submitted to our sales department, and we will get back to you soon. The unit can automatically test with PASS & FAIL indication all types of solid state voltage regulators 12 & 24 Volts. 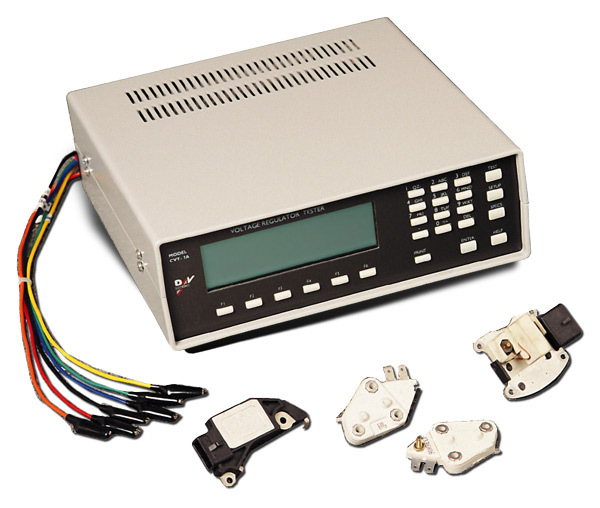 For precise regulator testing, alternator’s signals and car’s connection are fully simulated. CVT-7A can verify assorted special functions on the regulator, such as SSD, LRC, computer control, etc. The testing unit can simulate energizing of the alternator for TOS comparison. The CVT-7A has built in protection against short circuit. During the test, measured results are displayed and compared with preset limits. The CVT-7A can also store specifications for more than 1000 different parts.